We are pleased to announce that ESATAN-TMS r7 is now released and available for download from our web site. New exciting features have been added to the product. ESATAN-TMS provides a powerful and integrated thermal modelling environment, supporting the complete thermal analysis process from geometry creation, radiative analysis, thermal analysis and the post-processing of the results. A major focus of this release is taking into account feedback we received from customers from the user survey performed at the end of 2013. The geometric model generated from CADbench has been significantly improved by extending the shape recognition algorithm to identify more instances of primitives, and also to introduce the option to automatically combine triangular elements into rectangles or quadrilaterals. To help reduce the overall model build time, a series of improvements to the GUI have been implemented. These include: redesign of a large number of the dialogs, an improved reporting layout, provision of an interactive visualisation axis and improvements to the interactivity. A point raised by a number of customers was the ability to save a model to a new name (for example, to save a back-up of a model). ESATAN-TMS r7 contains a model Save As option. A powerful feature of ESATAN-TMS is the ability to run any of the steps of the modelling process in batch. In ESATAN-TMS r7, the export language option has been extended to allow the complete language to be exported through a single dialog: that is, the Geometry, Radiative and Thermal language. The changes in ESATAN-TMS r7 include an improvement to the handling of the exchange of radiative data between Workbench and ESATAN-TMS Thermal, providing a significant performance improvement. The data storage of the linear conductor data within Workbench has been optimised and also dependency introduced such that the linear conductor data is only updated if it is out of date. ESATAN-TMS supports the definition of Properties which can then be assigned to material bulk properties or thermal boundary conditions to simulate time or temperature dependency. At the request of customers, the usage of Properties has been widely extended to other Workbench entities, such as User-Defined Conductors and the through-conductance of shells. The ability to model geometry on a specific point on the surface of the Earth was introduced in ESATAN-TMS r6. 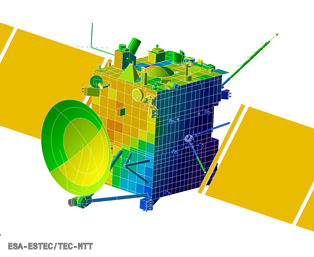 In ESATAN-TMS r7, this has been generalised to allow modelling on any planet surface. A prerequisite for the definition of a non-regular mesh is the definition of a Real Vector defining the mesh positions. To make the definition more interactive, in ESATAN-TMS r7 the ability to directly define the mesh positions (as real literal values) has been provided. This facility has been implemented such that any Workbench entity expecting a Real Vector can be defined as literal values. These entities include the Night-Side temperature and the True Anomalies of a Radiative Case and the Waveband Frequency of an Analysis Case. Significant performance improvement have been achieved within ESATAN-TMS r7, making the interactive use of Workbench much more productive. The STEP-TAS import and export functionality has been upgraded to link with the latest STEP-TAS library (STEP-TAS rc5, IITAS C++ SDK 1.0.RC5).